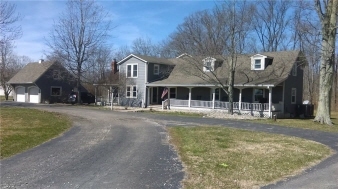 WOW, Horse Lovers Dream, 45.43 Acres, Huge 4-Bd Rm, 3-Bath Home. Beautiful Kitchen w/Brick Floor, S.S. Appl., Lots of Cabinets, Granite Counter Tops/Island. Large Living Rm. Hardwood Floors, M. Bedroom W/Granite/Ceramic Bath, Huge Walk-In Closet. Nice Great Rm W/Rock Wall/Corner for a Wood Stove. Big Utility Rm. Covered Front Porch & 2-Decks, 2-Car Garage, 20x40 In Ground Pool W/Heat & Cover. 8x16 Under Ground Bunker, 156x70 Pole Barn-Indoor Arena, 56x36 Pole Barn W/Office, 8 Stalls & 30x30 Newer Living Quarters Above, 96x48 Pole Barn W/Concrete Floor, Electric, & 48x32 Workshop Inside. 40x30 Tramp Shed, 7-Outdoor Turn Out Pens, 3-Hydrants, Huge Outdoor Arena, Approx. 8 Acres Pasture/Hay Field, 3-Ponds, 2-Grain Bins, Paved Drive. $699,000 Call Ron Smith at 317-445-5922.